These instructions can be used to solve a 5x5x5 cube, also known as the professor cube due to its difficulty. These directions are a graphical version of those given by Jacob Davenport. The figures in this document represent a sample cube. Although the colors on your personal cube may be different than the figures, I feel that the colored figures will still be helpful in solving the cube. I would suggest matching as many colors on your cube as possible to the figures, then making mental notes about which colors correspond between your cube The diagrams show all six sides of the cube by pretending that mirrors are being held up so that you may see the "hidden" sides. The directions for what parts of the cube to turn and when are given in a code that is relative to the current positioning of the cube. 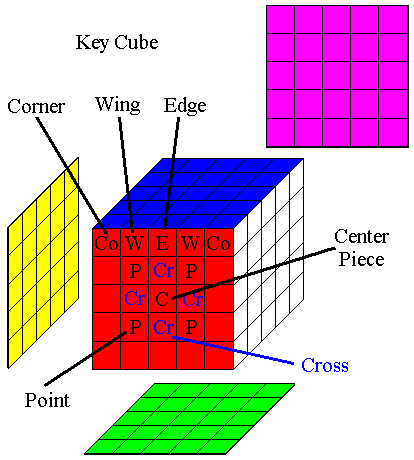 Each side descriptor refers to a side with respect to the figure the move is referenced to. This means that the front side can be a different color, depending on the diagram being used. 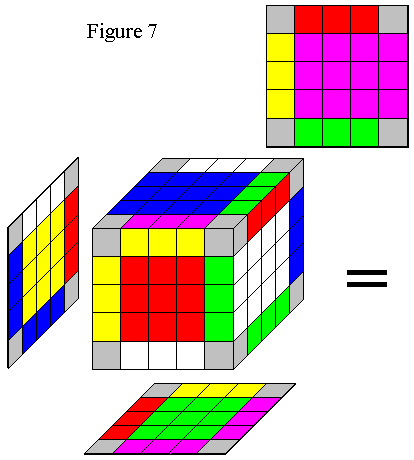 See Move 1 of the 3x3x3 Rubik's Cube page for instructive diagrams to illustrate the moves. H for the horizontal center slice (between u and d). Since the lower case L: l looks like the number 1, a letter by itself means to turn the side clockwise one quarter turn. A letter with a 2 following it means to turn the side two turns (halfway around). A letter with an apostrophe (') means to turn the side counterclockwise one quarter turn (a -1 can be used in place of an apostrophe, but the apostrophe takes up less space). For example, U F2f2 D' Ll means to rotate the upper side clockwise one quarter turn, the front side and 2nd layer in from the front side clockwise twice (half way around), the down (bottom) side counterclockwise one quarter turn, and the left side and second layer in from the left side clockwise one quarter turn. Look directly at the specified side indicated to determine which direction is clockwise or counterclockwise. For the central horizontal slice H, look at the cube through the top side to determine the clockwise direction. In the figures, any gray pieces represent pieces that don't matter and can be any color. To increase clarity, I have shown a lot of colored pieces. In most cases, the figures represent an example of the situation being described, while the colors don't have to match perfectly. Pick a center piece to represent the first side of the cube solved (blue in these figures) and solve the points and crosses on that side. One cross may be left empty since it will be used as the "keyhole" later on. Get the four green points on the down (bottom) face in place, using Move 2a and Move 2b as necessary. Orient the cube as shown in Figure 2a, where the two points to be moved into place are on the right side of the front face while any green points already on the down face are on the right side of the down face, then perform Move 2a. You will need to rotate the front side and middle horizontal slice as necessary to place pieces into position. In words, rotate the Right side and 2nd layer in from the right side counterclockwise one turn, the down (bottom)side two turns (180 degrees) and the right side and 2nd layer in from the right side clockwise one quarter turn. Orient the cube as shown in Figure 2b, where the one point to be moved into place is on the right side of the front face while any green points already on the down face are on the right side of the down face, then perform Move 2b. Solve the remaining 16 points on the four sides. 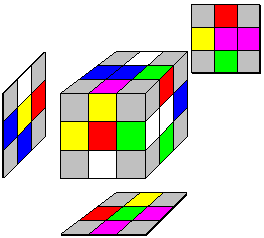 Accomplish this using Dd moves (bottom two layers) along with F (front side) moves. Rotate Dd freely to get Points next to their centers, then F to put the points up to the upper layers, yielding Figure 3. Now use Moves 3a and 3b as needed. Complete the Blue and Green crosses. Pretend the cube is a 3x3x3, ignoring the outside edges. Insert pieces into the bottom via the keyhole using Move 4a. During this process, it's all right if the horizontal center pieces move around. When the bottom is completed, finish the top using Move 4b to get the last piece into position. Move the piece to the right hand side by rotating H (the central, horizontal slice), then rotate the right hand side, bottom, and top until it looks like Figure 4a. Now perform move 4a. 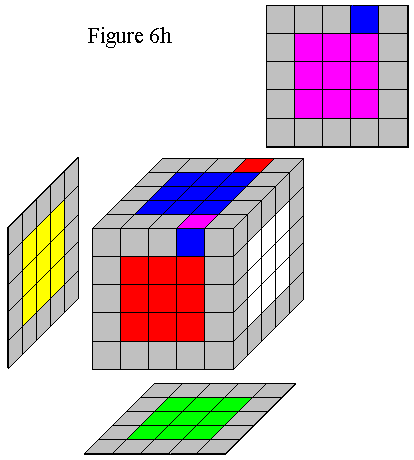 First complete the upper cross piece of each side using H and F moves, giving the cube in Figure 5. Now use Move 5a to rotate eight of the equator pieces (swapping between opposite faces) or Move 5b to rotate between adjacent pieces. At times you will have the situation of having to swap only two Crosses with each other, rather than doing two swaps at the same time. 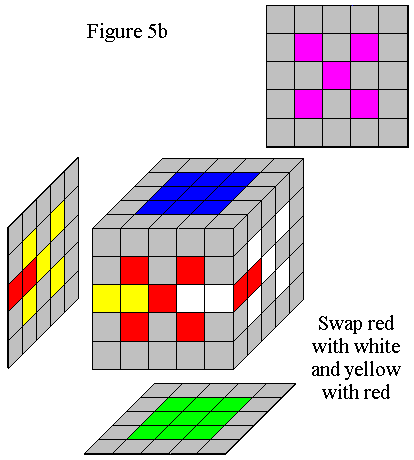 Move 5c will succeed in swapping the two pieces. Note: In this move, "Ll" indicates capital L and lowercase "ell"; thus "Ll" means to turn both the left hand side and the 2nd layer in from the left hand side one quarter turn. Use Move 6 to join wings with their appropriate edge piece. When doing this move, be sure that the wing piece at the back of the second row of the left side does not already match it's neighboring edge. If it does, place a different wing piece on the left side so as to not mess it up. This process will take quite some time. After you have associated a few of the wings and edges, begin to pay attention to the movement of the piece from the back-left of the cube to the back-top of the cube, trying to align the piece with the top back edge. About 50% of the time you will get a "Parity Problem", meaning that you'll have either two or four wings left to position. Move 6a will not work in this situation, since it moves three pieces. Instead, use Move 6d to fix the parity problem. This is simply Rr U2 five times. 6e. Another parity Error situation occurs when one edge (and one edge alone) has it's two wings flipped, yet the other 11 edges are all solved. Use your favorite 3x3x3 solution to solve the cube, since the edges and wings act like the single edge pieces of the 3x3x3, the corners directly correspond to the corners, and the centers, crosses, and points correspond to the center pieces of the 3x3x3, as shown in Figure 7.